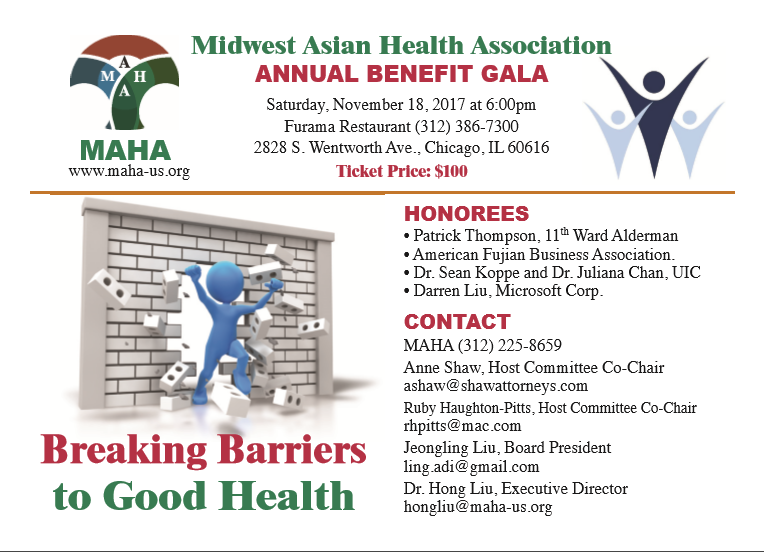 On November 18th (Saturday) 2017, the Midwest Asian Health Association (MAHA) will host its 7th annual benefit at 6pm-8:30pm at Furama Restaurant, 2828 South Wentworth Avenue, Chicago. The theme is “Breaking Barriers to Good Health”. This year, MAHA aims to break down the barriers in our communities that prevent medically underserved populations from enjoying good health. Examples of barriers that our communities face include stigma related to mental health illness and substance abuse, lack of health insurance, low health literacy, lack of program resources, and cultural and linguistic barriers to accessing health-related information and care. Among our efforts, we will be increasing our capacity and partnerships to support and expand our services, raising awareness about mental health issues especially among seniors and youth, advocating for local policies that prevent youth from substance use, and supporting health care providers in educating and empowering their patients to make informed decisions regarding their own health. MAHA’s mission is “to reduce health disparities for the medically and underserved low-income populations in the Midwest through developing and providing culturally sensitive and linguistically appropriate services, including community outreach education, screening and immunization, linkage to care, capacity building, data collection, research, and policy advocacy”. Please help make MAHA’s” Breaking Barriers to Good Health” fundraising banquet a success by becoming a sponsor. You will be making a tax-deductible contribution to helping our minority populations, gaining valuable exposure for your organization/company, and providing important philanthropic leadership within our community. 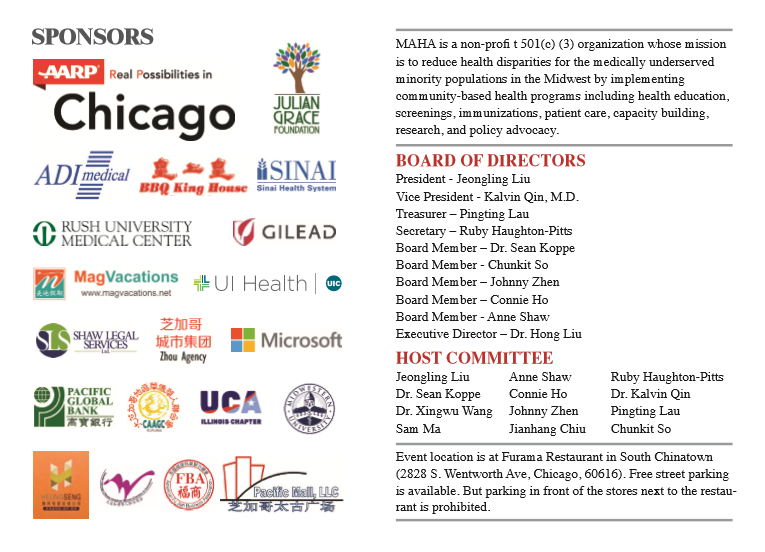 If you have any question, please feel free to contact me at 312-225-8659 or email to hongliu@maha-us.org. Thank you very much for your support.